Sweet pears and tart cranberries combine to make this warm, flavourful, and scrumptious pear cranberry crisp. It’s a satisfying and comforting gluten-free vegan fall dessert everyone will love! You know when fall rolls around and it starts to get really cold and all you want to do is be indoors so you can avoid the chill and eat warm, delicious things? I don’t think it’s just me who feels this way once the temperatures dip down, I know there are more than a few of you who are missing summer, too. This recipe is the kind of recipe that’s perfect for cooler fall days (but it can also be enjoyed any time outside of fall!). And it’s also the kind of recipe that makes you feel not so bad that it’s so cold outside. 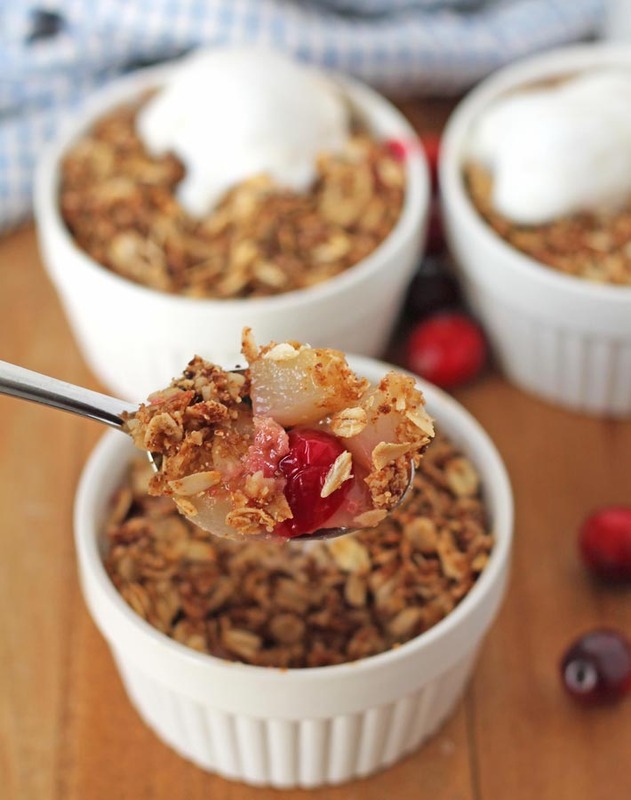 It consists of warm chunks of sweet pears, a sprinkling of tart cranberries to provide just enough, but not too much, contrast for the sweetness, and then topped with a warm, crumbly oat mixture blanket that contains a hint of cinnamon flavour. It also happens to be vegan and gluten-free, if you use gluten-free oats. How does that sound? So good, right? The recipe is also very easy to prepare and leftovers (if you have any!) will keep in the refrigerator for a few days. I chose to make my pear cranberry crisp in individual ramekins so everyone would have their own. If you don’t already have a set of ramekins, I highly recommend investing in a set. I have several sets, 3 to be exact, and all are different sizes, which is handy, because I have a size that’s suitable for whatever I’m making. They can be used for so many desserts and even individual main courses. For this recipe, I used 8oz ramekins and you can find them here on Amazon or in local stores that carry kitchen tools and dishes. 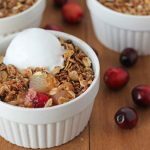 What is the best type of pear to use for pear cranberry crisp? The best type of pear for baking is a firm pear like Bosc, Anjou, or Bartlett (what I used for this recipe). I bought my Bartlett pears when they were just ripe and still very firm but sweet, and they came out perfectly. For this recipe, you want your chopped pears to still hold their shape after they have baked, so be sure that the pears you use are not too ripe or overripe because they will become mushy, which is not ideal. 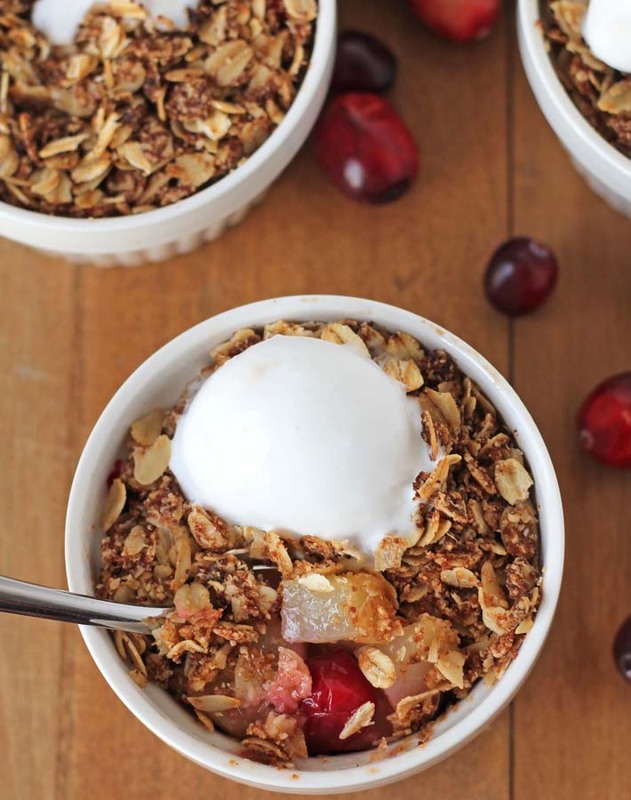 Can frozen cranberries be used in this recipe? Yes, but if you use frozen, you will need to add a little extra arrowroot starch to account for the extra moisture they will release (full details are in the recipe below). Do separate ramekins have to be used for this recipe? No, you don’t have to use them. Ramekins are great for making individual sized desserts, but not necessary. You may also make this recipe in an 8 x 8 baking dish. What kind of coconut oil should be used? I have tested with both refined and extra virgin coconut oil and both results were great, but note that if you use the extra virgin, your crumble will have a slight coconut flavour. 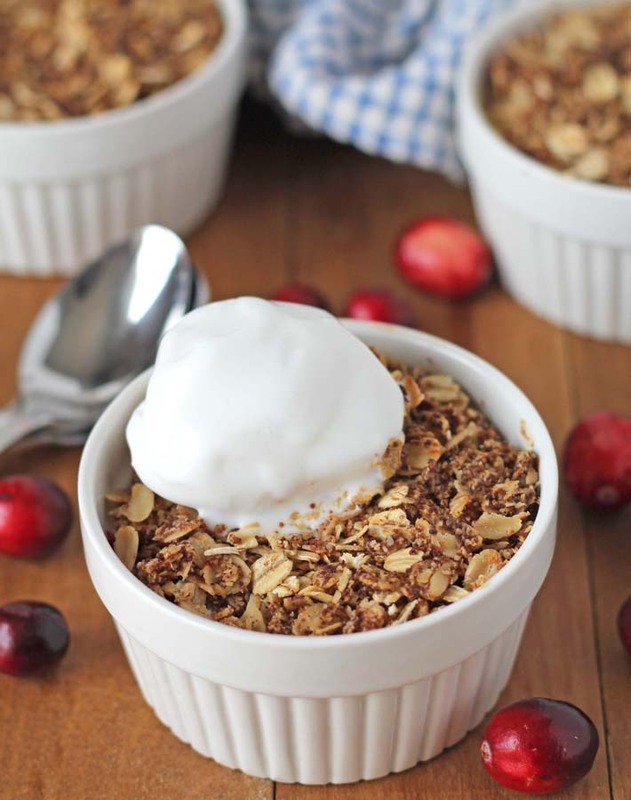 What should pear cranberry crisp be topped with for serving? You can enjoy your dessert plain or with coconut whipped cream or vegan vanilla ice cream. Don’t forget to subscribe to my newsletter to stay up to date on all of my latest recipes. 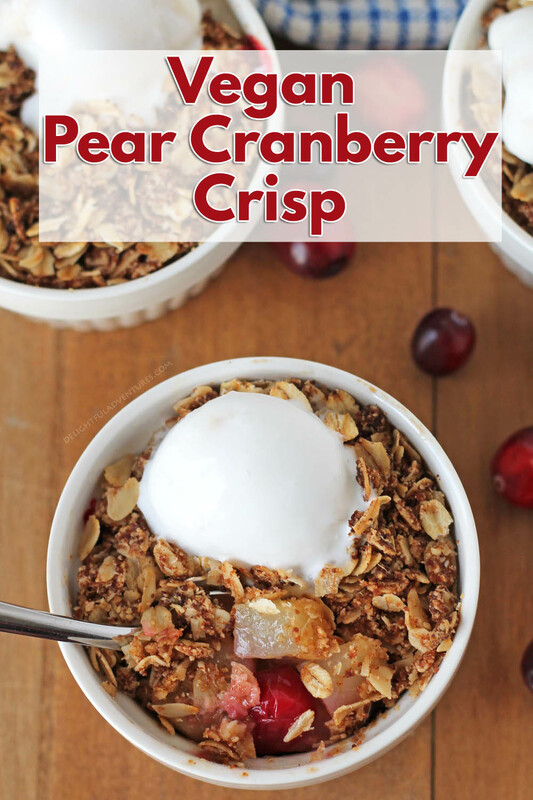 And if you make this delicious pear cranberry crisp, share a pic with me on Instagram or tell me about it in the comments below! Sweet pears and tart cranberries combine to make this warm and flavorful pear cranberry crisp. It's a delicious & comforting fall dessert everyone will love! Lightly grease the bottom and sides of 6 x 8oz ramekins OR an 8 x 8 baking dish, with coconut oil. 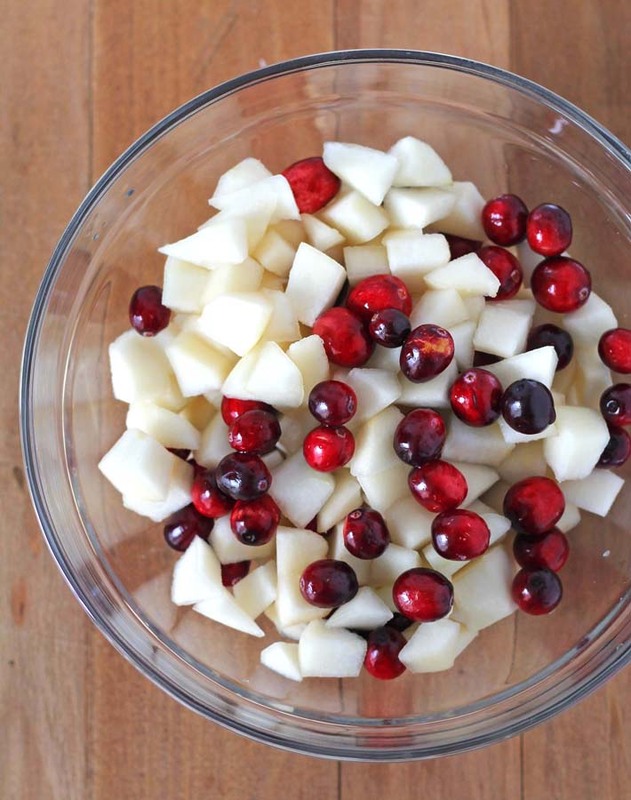 Add chopped pears, cranberries, sugar, lemon zest, and arrowroot starch to a bowl. Stir until combined. 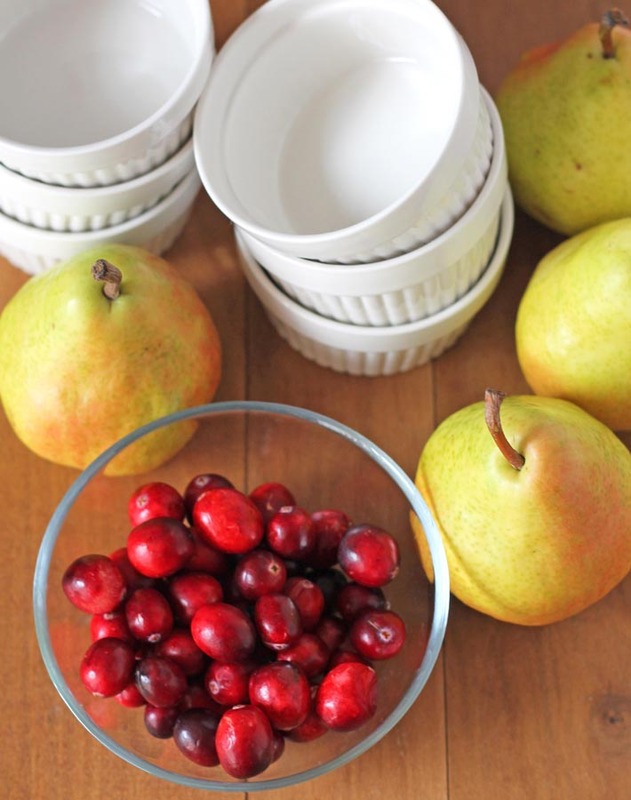 Add pear/cranberry mixture to ramekins or an 8 x 8 baking dish and spread so you have an even layer. Set aside. Add rolled oats, oat flour, coconut sugar, and ground cinnamon to a bowl and whisk until combined. Add coconut oil to oat mixture and mix until combined and crumbly. Add oat mixture to the top of the fruits in the ramekins or baking dish and loosely spread to make an even layer (don't pack it down). Bake ramekins for 25-30 minutes until the fruit is bubbling and the top is golden. Bake 8 x 8 dish for 30-35 minutes until the fruit is bubbling and the top is golden. Cool before serving, best when served warm. Please read FAQ above for helpful tips to ensure your dessert is a success, before making this recipe. This dessert is best enjoyed the day it was made, but if you have leftovers, store in an airtight container in the fridge. Warm up before serving again. If using fresh cranberries, use 2 teaspoons of arrowroot starch, if using frozen cranberries, use 3 teaspoons of arrowroot starch. Nutrition info listed below is for 1 of 6 servings (without any toppings) and is only to be used as a rough guide. Click here for more info on how nutrition info on this website is determined.